If your home is experiencing a termite problem, check out the four best termite sprays of 2019. These termite control treatments are available in stores worldwide and provide an immediate pest deterrent solution. In this article, we provide analysis of the best termite sprays specific features and benefits. First, however, let’s give a rundown of some basic termite informatio. Termite infestations are a serious problem for homeowners and pest control services. Termites are hidden from sight inside the walls, beneath the floors, and under your roof tiles. They eat away anything that has cellulose, which is abundant in timber. Everything made of wood is a meal ticket for a termite. So, unless you want to offer up your house as a buffet to these little critters, it’s important to use a form of termite control. The most extensive form of treatment is fumigation, but newer homes have no need for such extremes. For spot treatments and low-level infestations, a termite spray will do the job sufficiently. Just like termites themselves, even some of the best termite sprays are better than others. When introducing insecticide chemicals into your home’s living space, safety is of the utmost importance. Products with no safety warning are ineffective, as they don’t contain the strong chemicals needed to treat a termite problem sufficiently. On the other hand, some termite sprays will pose more risk than reward. Our picks of the four best termite sprays offer an effective combination of power and precaution. Premise Foam Termiticide Termite Spray is the best pick for blocking up empty spaces where termites fester. The foaming liquid expands 30 times the original volume. The foam expands deep into the tiny holes and cracks that termites use to enter a home’s interior. Premise Foam Termite Spray does not repel termites. Instead, it acts as a slow release poison, which gets spread to other termites. Mixed into the foam is a powerful termiticide chemical, which remains dormant for several days before killing the bugs that come in contact with it. The purpose of this delayed reaction is to eventually spread the poison back to a colonies queen thereby destroying the entire termite colony. While the foam is drying, no one can come in contact with the liquid. Once dry, the foam is safe to humans. The canister contains a pre-mixed formula, so you don’t have to worry about combining any raw chemicals. We recommend Premise Foam Termite Spray for use in crawl spaces, basements, attics, home exteriors, between the exterior and interior walls, and behind hard surfaces and mortar. 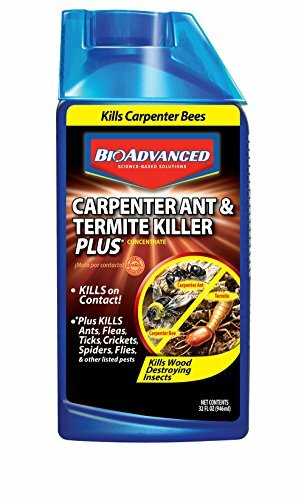 Bayer Advanced Carpenter Ant & Termite Killer Plus, is a kill-on-contact, liquid termite solution. Unlike the Premise Foam Spray, Bayer Advanced Termite Killer is meant to be mixed with water, in an outdoor fertilizer sprayer. The sprayer is sold separately. Bayer Advanced Termite Killer Plus does not repel termites. Instead, it kills termites, spiders, ants, and a bunch of other pests as soon as they come into contact with it. The spray also leaves a residual effect for up to four months. This spray is the best store-bought termite treatments for use around the perimeter of your house. The solution gets sprayed onto and into the soil surrounding a home’s foundation. We recommend the Bayer Termite Killer Plus Spray for immediate results and use it with the Premise Foaming Spray for complete coverage from termites. For termite problems that exist inside the interior of a home, or near livable areas, Terro Carpenter Ant & Termite Killer is the best choice. The aerosol spray kills termites on contact and can be dispersed at a wide angle, or precision angle. The canister’s wide-angle feature allows users to saturate a large area or many pieces of lumber at once. Flipping on the precision nozzle lets you spray the product directly into crevices, cracks, and holes. It also provides residual protection for up to four weeks. You can use it on the interior and exterior of your house and it is safe enough not to emit an odor. The termite spray won’t stain wooden floors or walls, which makes Terro Termite Killer the best spray for inside your home. 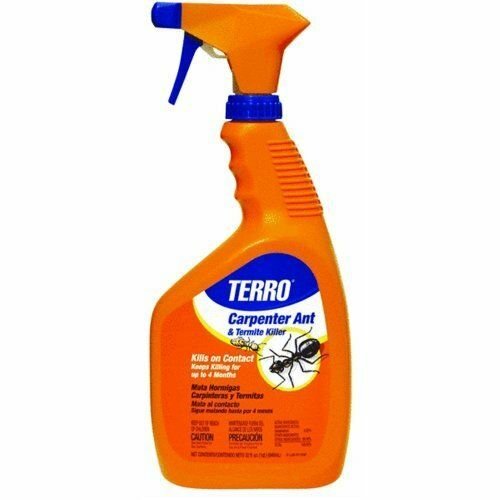 Terro Carpenter Ant & Termite Killer Ready-to-Use is the best termite spray for furniture and wooden furnishing. The simple pump bottle design allows you to control exactly how much product is used. This comes in handy when restoring or salvaging antique furniture or spot treating an area of a bedroom. Like its aerosol counterpart (above), Terror Ready-to-Use Termite Spray kills pests on contact and continues to provide protection for up to four weeks. Terro uses the active ingredient deltamethrin—a powerful insecticide. However, Terro Termite Sprays must be used with caution, as contact with the skin is an allergen and can trigger asthma. Simply follow the safety instruction for use included with the spray. Terro Ready-to-Use Termite Spray is the best for use on door frames, window sills, and baseboards. Termites break down the rotting vegetation of the forests and produce soluble nutrients for regenerative growth. Termites are an ancient descendant of the modern-day cockroach. Millions of years ago, during the Jurassic or Triassic period, termites evolved. They live in colonies very much the same way that bees and ants live. A colony’s hierarchy is focused on fertility: fertile males are kings, fertile females are queens, and infertile males and females are workers. This structure makes termites a formidable opponent to destroy. Only by taking out the queen termite will a colony be destroyed. That being said, termites are extremely beneficial for the earth. They break down the rotting vegetation of the forests and produce soluble nutrients for regenerative growth. Without termites, the earth would be a giant rotting vegetable. However, they don’t quite understand the difference between forest timber and the floor joists in your home. So, though they are great for the environment, they must be eradicated from human structures. Termites go through three stages of life: egg, nymph, and adult. A termite colony, unencumbered, will grow in size, from year to year. Some colonies live for decades with just a single queen that single-handedly produces every other termite. Termite colonies of three to five decades of age can reach numbers of over a million. These colonies are self-regulating, acting as a collective hive mind, which gives them the classification of Superorganism. Thousands of species of termite exist on the planet, with more discovered every year. Environmentally, termites can be split up into three classifications, based on their natural habitat and geographic area. These include subterranean, dampwood, and drywood termites. Subterranean termites make the largest nests and the biggest colonies. They live underground, in the soil beneath and around the foundation of your house. Subterranean termites are the most destructive to homes in the United States. If untreated, they will eat through floor joists, exterior walls and more. The size of these colonies makes for fast work in chewing through a home’s timber. If your home is near woods, in an area of high moisture, you will find dampwood termites. Luckily, they keep to themselves in the forests and woods—not your home. These termites live above the soil, inside trees and in the canopies. The wooden timbers and structural supports in the walls of your home are kept dry. Dampwood termites only live in the moist, rotting trees of forests and woodlands. However, if your home experiences water damage, all bets are off. Drywood termites, also known as termite swarmers, will not be found in the ground. These critters take to the skies, fly into your home, and find a nice, crunchy upright two by four support on which to munch. They are widely responsible for damage to homes and building structures. However, unlike subterranean termites, drywood termites take a long time to chew their food. Therefore, it takes them quite a while to cause serious damage to your home. Even so, you will not notice the infestations presence, until the damage has been done. The first place to look for termite damage is in the wood of your home. Unfortunately, if the wood damage is readily apparent, it means there is a significant infestation in that area. Finding wood damage is a sign that you should call a professional to appraise the situation. Check for soft or spongy wooden floors. If flooring is abnormally spongy, it could be an indication of termite damage to your floor joists. If you have access to your home’s supporting studs, check for hollowing of the wood, by knocking on the beam. Start at the base and work your way to the top of the wooden beam, listening for the knocking sound to change, from solid and muted to hollow. Drywood termites have wings before they find a suitable place to eat and reproduce. Once they find dry timber, their wings come off as they squeeze their way into the wood. A sign of termites is discarded wings. Look at the floor of your house, near baseboards, studs, and anything with wood. If you see little, crunchy wings strewn across the ground, it’s a clear sign of termites. Subterranean termites create mud tubes in the exterior of objects, structures, and materials that connect directly to the earth. Look for brown lines that follow a meandering path, from low to high. These are easily identifiable on structures of a contrasting color like stone, concrete, and cement. These tubes are used by termites to regulate their body temperature. Use a knife or stick to remove some of the mud tubes. If termites crawl out, use a termite spray spot treatment to kill them—then call a professional. The extent of an infestation is like an iceberg: the majority of it is unseen. Unlike bat poop, termite poop is not toxic or harmful. However, it is a clear indication of a termite problem. Look for tiny brownish-black pellets on wood surfaces, floorboards, and at the base of door and window frames. If you find any little wood colored, pellet-sized excrement, it’s time for your house to get a professional termite treatment. If you have any living plants in your house, termite poop is a great fertilizer. Scoop it up, and throw it in with your plants. If you don’t have plants, throw it outside in the grass. A termite spray is an application of termiticide that is dispersed using a wide angle projectile application. It involves a pump system and can consist of a liquid or foam treatment. Professional termite spray treatments are used for spot applications, in conjunction with a liquid treatment to expose the colony. For consumers, diluted spot treatment applications can be done with a store-bought termite spray. However, these are only suitable as a deterrent and for small areas of exposure. As a preventative measure around small areas, however, they are convenient and effective. Read below to see our picks for the 4 best termite sprays of 2018. Pest infestations require immediate and long-term approaches in order to be exterminated, for good. Preventative measures and spot treatments can be administered by our picks for the four best termite sprays of 2018. They provide immediate and short-term solutions to termite infestations. If you have termites, the best solution is to use Precision Foam Termite Spray for nooks and crannies, Bayer Termite Killer Spray for around the outside of your home, and Terro Termite Spray for your home’s interior. All the while, have someone call a professional to find out about the best termite treatments for long-term protection. Thanks for reading about the four best termite sprays of 2018. If you have used one of the products mentioned in the article, feel free to leave us a comment or question regarding your experience. And don’t forget to sign up for our weekly newsletter.